This year’s Pawpaw Festival is upon us, and this year my book “Pawpaw Is My Favorite Flavor!” will be added to the list of vendors who will set up camp at Lake Snowden. The 20th Annual Ohio Pawpaw Festival is Sept. 14-16. 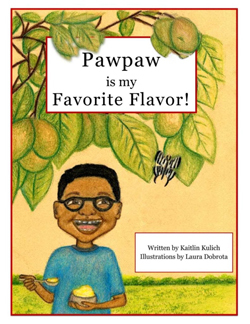 Published under Monday Creek Publishing, Pawpaw is My Favorite Flavor! is about a little boy named Henry who visits his grandpa’s farm in Athens, OH, to pick pawpaws to make homemade ice cream. The underlying themes of the book highlight the importance of family and sustainable, local food and showcase an often-forgotten group of people in Appalachia; African Americans. The book comes with a recipe for pawpaw ice cream that is simple and fun for children to do with an adult. Readers will also learn about the history and other fun facts about pawpaws they may never known before. Laura Dabrota, from Nelsonville, OH, is the illustrator. She teaches at Hocking College and is excited to read the book to her young son. This is her first time illustrating for a children’s book. The book will be available online on amazon.com and barnesandnoble.com as well as several local book stores in Athens. I will be at the children’s section of Pawpaw Festival with copies of my book for sale. Connect with Kulich on LinkedIn.